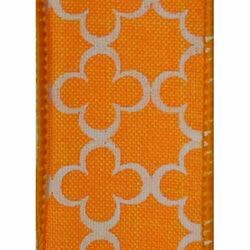 Orange Trelly is a beautiful orange textured wire edge ribbon with a white clover shaped trellis pattern. It is available in a 1 1/2 inch width on a 25 yard spool. The colors in the picture may vary slightly from the actual product color.